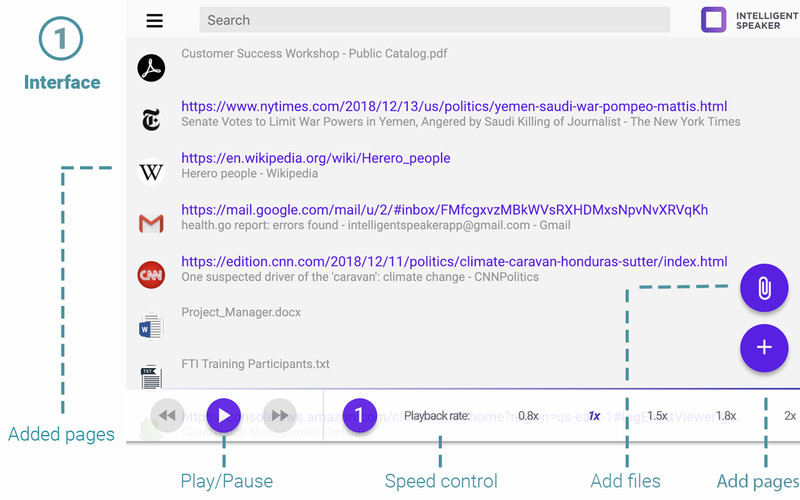 Text to speech browser extension runs on leading tts engine and has useful features to make you productive. With Intelligent Speaker you can sync your content with any rss/podcast reader program. You are able to listen to all your texts from your list on your smartphone or tablet, wherever you are, whatever you do. Use Intelligent Speaker in your own way. Do what you love and do it productively! 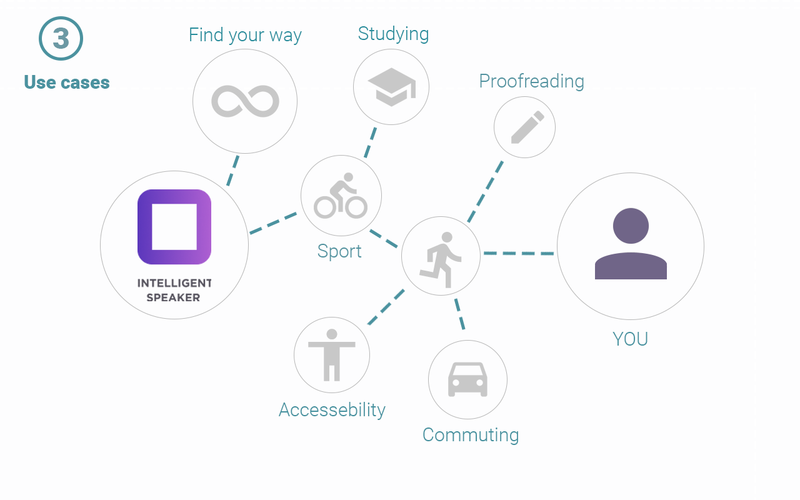 Intelligent Speaker is browser extension which means it is integrated to your browser. When you install Intelligent Speaker, you’ll see the icon in the upper right corner of your browsers’ panel. All you need to do is to click on the icon and open the links on webpages you’d like to listen to. Click on “Plus” button in Intelligent Speaker player or right click your mouse to add the link to the feed. After the link appears in the feed, you can listen to the text. You can use different speeds you’re comfortable with and divide your text into chunks. Every time click on Intelligent Speaker icon, you’ll see your list of listened content. You can listen to it anytime with no additional minutes taken. For tech guys: we use "event page" so our extension in your memory only when you need it - otherwise we not pollute your RAM. Can I add a segment of text instead of the entire article? Yes, all you need to do is to highlight the text segment you want to listen to and add it to the feed by clicking on “Plus” button or mouse right click drop down menu “Add to the feed” button. After a moment you’ll be able to hear the fragment you’ve added to Intelligent Speaker feed. Remember that all of what you have been added is also available on your podcast feed! Can I use Intelligent Speaker on smartphones and tablets? 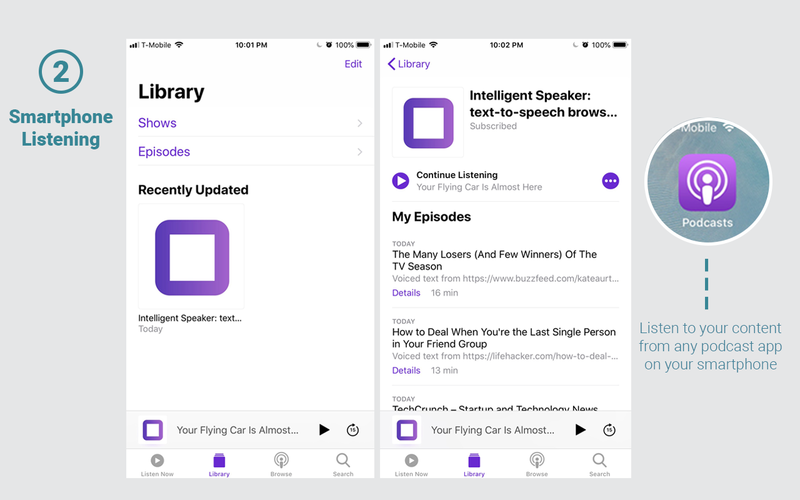 Yes, you can get your personal podcast link from the Intelligent Speaker extension menu and add this link to any podcast app or RSS reader installed on your smartphone, tablet or any device. If you have Apple products, you can use native app called “Podcasts”. If you use Android devices, you can use any app you prefer, for example Castbox (free app). Can I listen to articles in different languages? Yes, Intelligent Speaker speaks in 20 languages. This browser extension automatically detects text on the page and reads in the language of the content. To change the language of Intelligent Speaker interface, click on Intelligent Speaker icon, in the left corner of the player you’ll see menu, click on it and choose the language you’d like. How to get podcast from my Intelligent Speaker list? To get your own podcast with all the articles and texts you’ve added to your feed, you will need to go to the menu and click to “Email podcast link”. In a moment you’ll get your personal podcast link with the instructions on your email. You can open your email app on phone or tablet, copy the link and insert it to any podcast/RSS reader (or just try to click on this link). Can I listen to my texts offline? Yes, you can have offline access to all your added texts from podcast/RSS app on your smartphone/tablet through the podcast apps. Also we support offline on extension side - just wait for finishing of fetching your audio (hover your mouse to the download ico of any added article). Is Intelligent Speaker free ?